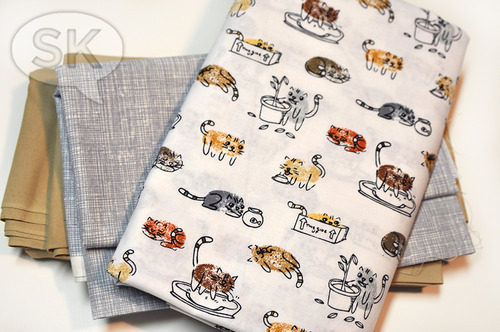 Samarra Khaja here, infiltrating SewTimeless to bring you this feline-friendly tutorial using my new Thumbprint Cats! Sure, you may think that Mr. Fluffpants comes into your bedroom and stands on your face at 5:00am because he’s hungry. 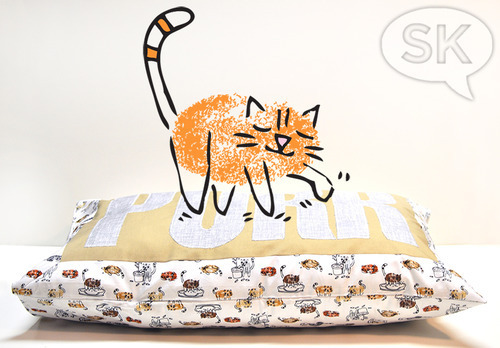 There’s a slim chance that’s true, but it’s more likely that he wants a PURR Pillow of his own to snooze on. 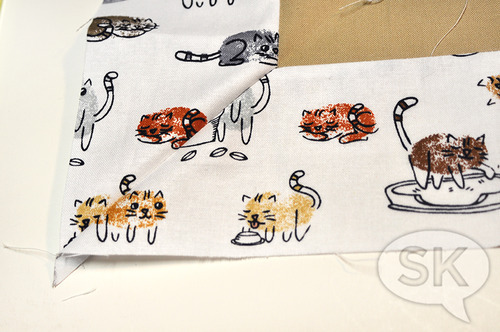 So before anyone gets their claws out, let’s get on with making one, using my latest SK fabric design, Thumbprint Cats!! Note: All seam allowances are 0.25″. 1 – 20.5″W x 30.5″L piece of Thumbprint Cats (TC) with pattern running lengthwise. 1 – 8.25″W x 20.5″L piece of TC with pattern running widthwise. 2 – 3″W x approx. 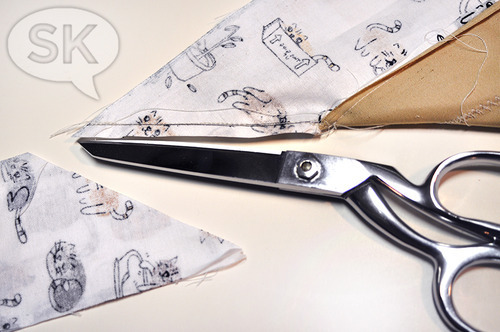 34.5″L (you’ll trim these down to 30.5″ later) strips of TC, with the pattern running lengthwise. 2 – 3″W x approx. 24.5″L (you’ll trim these down to 20.5″ later) strips of TC, with the pattern running widthwise. 1 – piece of Soho Sketch Gray (approx.13″W x 23″L) to cut out the lettering from. 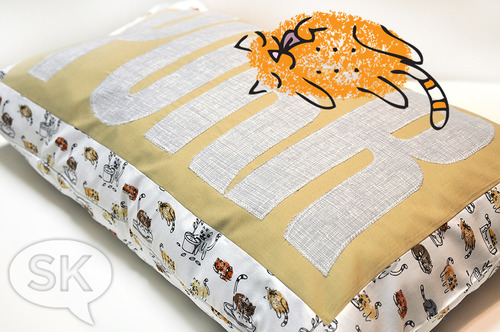 I made my own 20 x 30 pillow insert using spare white cotton fabric and Pellon’s Perfect Loft. 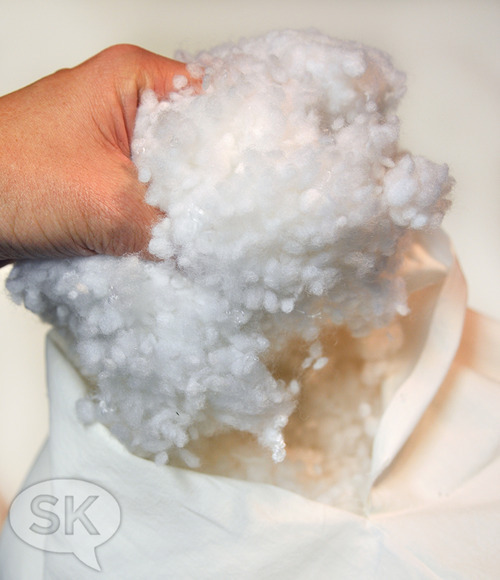 I’m not going to lie, this stuff is awesome and I wanted to play with it more than getting on with the stuffing process. I used about 1.5 bags worth, but you can stuff yours to whatever density your #1 Cat Boss of the House prefers. If you’re not feeling as ambitious or Mr. Fluffpants is giving you some major stink-eye glances to hurry up already, this project will also fit over a Pellon Pet Bed Insert, so you’re golden no matter which way you choose. Print out this PDF to create your ‘PURR’ letter templates (printout at 100%; you’ll then cut and piece together the tiled pages). 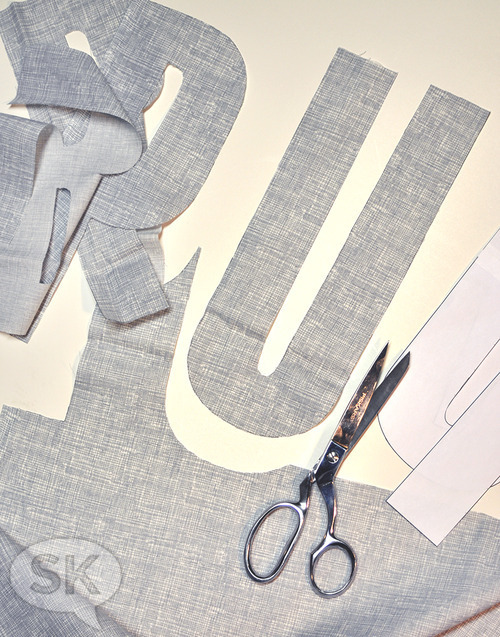 Once your paper letters are ready, you’ll pin them to your sketch gray fabric and cut those out. Although I personally don’t mind the slightly frayed edges, you might want to consider using a fusible webbing to help stabilize and give a cleaner cut to your finished appliquéd letters. 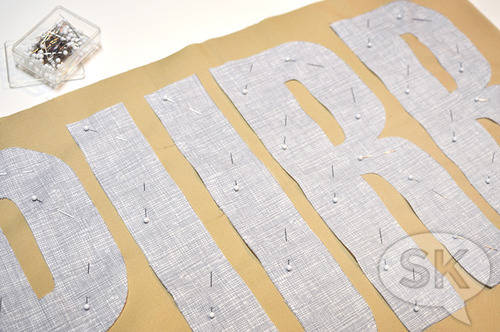 If you do want to use some, layer it under your fabric when you cut out your letters to save time. Mr. Fluffpants will appreciate your industriousness because, between naps, he really doesn’t have all day. Place all four letters evenly across your Soho Tan rectangle and adjust everything to look evenly spaced with an approx. 1.5-1.75″ border around the whole word. There is some wiggle room here to work with; don’t worry if it doesn’t look right the first time. Once you have everything to your liking, pin each letter in place (tack if using fusible webbing) and zigzag stitch to appliqué around all edges. I used a white thread, but you might consider a fun contrast color for added pop. 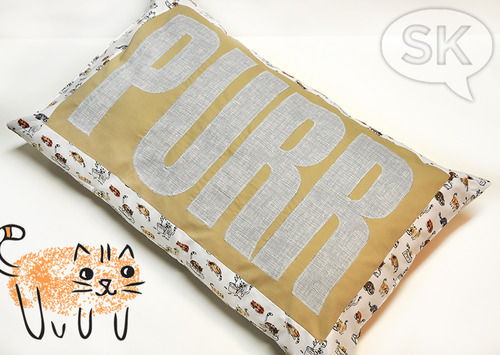 Now that the PURR word panel is complete, you’ll now add a mitered frame around it. Take your four strips of TC, center each one along each edge (2 short go on the short sides, 2 long go on the long sides). Make sure the design is oriented in the same direction. 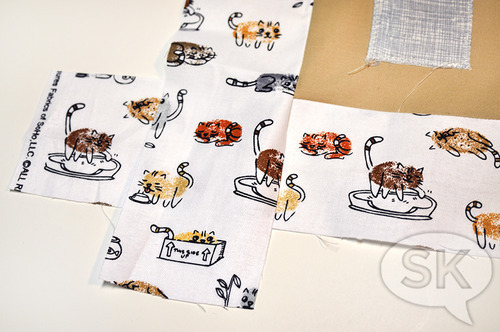 Also, the strips are intentionally longer than all the sides, so you have enough fabric for mitering. Once everything is positioned and pinned together properly, sew up each side individually from corner to corner. To create the mitered frame, you’ll start with one corner and fold everything diagonally along the 45-degree miter line we want to achieve. You’ll see that the frame strips will line up, so use that to help guide you. 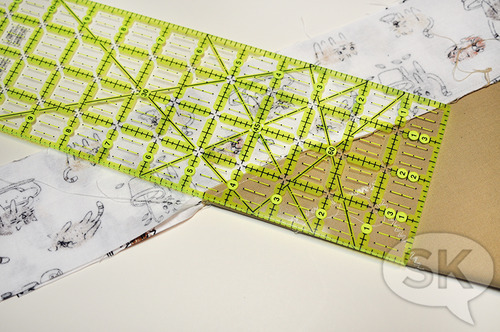 Using a ruler, mark a (washable) line along the frame fabric as your sewing guide. Now sew along that line and trim off the remainder. Do the same thing with the remaining three corners of your front pillow panel. Iron flat. The front panel of the PURR pillow is now ready. Set it aside. Now watch as Mr. Fluffpants comes and sits on it, marking his almost-mine territory. Now it’s time to deal with the back. 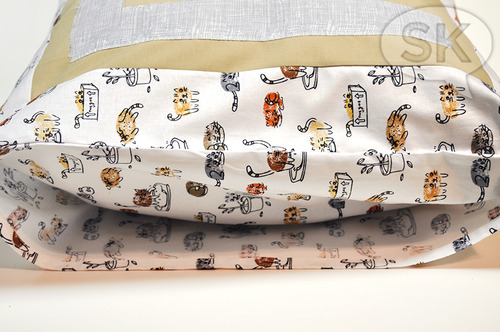 This pillowcase is constructed very much like a European bed pillowcase, which has a small inner flap to keep the pillow insert from creeping its way out and looking sloppy. Plus, Mr. Fluffpants is a worldly creature, so this suits his highbrow style. Once you’ve created both hems, you’re ready to assemble this bad boy. 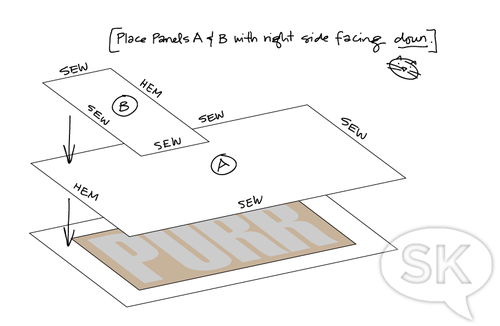 Align panel A onto the PURR panel with right sides together. 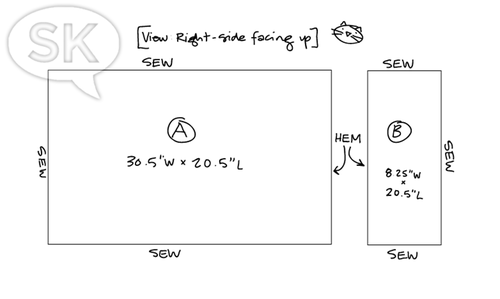 Now align panel B (with right side facing down) along the left side, as seen in the diagram below. Pin everything together. and sew around outer edge, making sure *not* to catch panel A’s hemline in the stitching! Now place it in that perfect spot on the floor in the sun, nestled on the sofa or at the foot of the bed for Mr. “I’ve been watching you the entire time” Fluffpants to discover. Paws crossed, it might just afford you one whole half hour more of sleep tomorrow morning!